These animations were made to study the motion of the C-H Chromophore in C6H. The molecular dynamics were computed using a force field containing intramolecular force terms through fourth order published by Maslen, Handy, Amos, and Jayatilaka1 in 1992. Wyatt and Iung published fifth- and sixth-order terms2, which are also included in the computations. This study3 models a C6H molecule which is initially at a ground-level vibrational state. We then excite the molecule by adding the energy equivalent of a single photon in the C-H bond, and follow the distribution of this energy through the molecule. 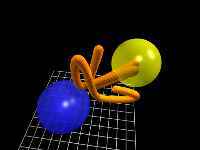 This is accomplished by computing the classical momentum and electrostatic force terms for each atom in the molecule at equally-spaced time intervals. The purpose of the study is to investigate the role of out-of-plane motion in the overall energy redistribution in the excited molecule. The total duration of the simulation is 2.4 picoseconds, though the short example animations below represent only small fractions of the entire simulation. In these animations, the molecule is oriented so that the C-H chormophore is located in the upper right corner of the molecule as viewed from the front. Only the C-H chromophore is shown, and the remaining carbon atoms in the molecule, i.e. the ones located beyond the grid, are omitted. The yellow sphere represents the hydrogen atom, and the blue sphere represents the carbon atom. In order to emphasize the motion of the hydrogen atom, the yellow sphere is plotted at the successive locations of the hydrogen atom in the model, and the preceeding locations of the atom are shown by an orange track. The shorter clips also include grids in the X, Y, and Z planes to help the viewer determine the orientation of the figure and his viewing angle. The first three clips show short examples of the three vibrational modes of the C-H chromophore: C-H stretch, (in-plane) C-H wag, and out-of-plane C-H bend. After time t = 0, the total vibrational energy of the C-H chromophore is never exclusively isolated in one particular mode, but is distributed among all three modes. Thus the electrostatic forces on the hydrogen atom cause it to move in complex combinations of the three vibrational modes. Of course, the same forces cause motion of the carbon atom, but since the mass is much greater than that of the hydrogen atom, the amplitude of motion of the carbon atom is not as large as that of the hydrogen atom. The final clip is a segment of the full animation, and shows almost a third of the full simulation. The C-H stretch is the most energetic of the local modes of vibration of C6H. This motion occurs radially along the axis from the carbon to the hydrogen. This clip begins with a front-on view of the chromophore, and moves to a side view. Even though the stretch amplitude is very high in this clip, there is still an C-H Wag component of motion (see below). This wag component produces a wide "V" shape in the animation. The out-of-plane energy is very low at this time in the model, as can be seen from the fact that the "V" remains in the original plane of the molecule. This clip represents about 65 femtoseconds of the simulation. This front-on view of the C-H chromophore shows the side-to-side, in-plane wag motion of the hydrogen atom with respect to the carbon atom. At this point in the simulation, there is very little energy in the C-H stretch mode, as can be seen from the fact that the hydrogen atom remains at a relatively constant distance from the carbon atom. Also at this time, the carbon atom is also beginning to exhibit motion, as can be clearly seen in this short outtake. This clip represents about 35 femtoseconds of the simulation. This edge-on view of the C-H chromophore shows a high-amplitude out-of-plane motion of the hydrogen atom with respect to the carbon ring. 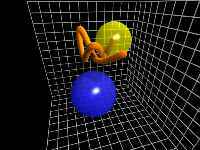 This motion, viewed as side-to-side movement by the hydrogen atom, is termed bend motion. In this clip, the bend is accompanied by a large component of wag motion (towards and away from the viewer) and a smaller amount of C-H stretch motion. This clip represents about 35 femtoseconds of the simulation. This animation shows one possible trajectory of the hydrogen and carbon atoms from excitation (t = 0) until t = 0.72 picoseconds. In order to minimize the storage requirement of the clip, only the lower grid is shown. The computations were performed by Todd J. Minehardt and Robert E. Wyatt using lonestar, a Cray T3E Massively Parallel Computer system. These animations were produced by J. David Adcock, a graduate student in the Wyatt research group. 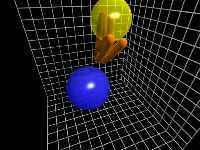 The graphics were rendered using the POV Ray Version 3.0.1 program. For more information, send e-mail to david@lanczos.cm.utexas.edu. 3. T.J. Minehardt, J.D. Adcock, and R.E. Wyatt, J. Chem. Phys. 303, 347 (1999).